Boing Boing gets the strangest stories. Coming back from rigor mortis level of death is a pretty happy ending though. I would LOVE to hear a good in depth medical analysis of this. In a third world country I might write this off as a hoax, but in West Virginia (look at me avoiding a joke) I’m thinking the paperwork and such would be around to back this story up. If so, how do you explain it medically? NASA have plans for a manned Mars expedition based on the Ares spacecraft they’re developing as a replacement for the Space Shuttle. Price estimates vary from $20Bn (presumably for a single round-trip) to $450Bn (presumably for a single round trip plus all the externalities, like developing the spacecraft and equipment and conducting a thorough prior reconnaissance using unmanned landers). I’m a fan of the Kindle concept (just not the price), and I’m a big fan of the OLPC concept (though the execution hasn’t matched original expectations), so when I see that the new version of the OLPC is expected to be in an e-book type format (at a cheap price) I’m intrigued. Pop over to the BBC site to see a picture of the prototype. The revamped machine created by the One Laptop Per Child (OLPC) project looks like an e-book and has had its price slashed to $75 per device. OLPC founder Nicholas Negroponte gave a glimpse of the “book like” device at an unveiling event at the Massachusetts Institute of Technology. The first XO2 machines should be ready to deliver to children in 2010. Computer as a Tool, and staying focussed. Zen habits has an interesting little piece on staying focussed at work. I found the following point very interesting though (emphasis added by me). Develop the mindset that the computer is only a tool. It’s easy to try and use the computer for too much. At its core, the computer is merely a tool (albeit a freakin’ awesome one) that allows to do work more efficiently. My wife and I have arguments over my computer usage, and I think the above is something she doesn’t “get”, or I don’t. For her (I’m supposing here, and expecting a rebuttal in the comments) the computer is a tool, but it’s a very specific tool for a very specific set of jobs. For me the computer is a tool for multiple jobs. For her, and many people, I think the computer is a glorified combination of a typewriter and a telephone, for me and my uses it’s a magic box which is a conduit for thoughts, ideas, and a plethora of other things. A swiss army-knife for my life if you will. I use it for research for writing (blog and otherwise), I use it to find information on my job (programming articles, etc), I use it to write with (my handwriting isn’t fast or legible enough to use if I’m going to attempt any sort of volume of writing), I use it for entertainment (podcasts, both audio and video, have replaced the largest part of my TV watching), I use it for socializing (I do a fair bit of face to face interacting at the day job, but for shooting the bull about the Braves, or literature, or Sci-fi, or whatever, I find the communities I’m involved with on-line fit my needs far better than going to a bar, or hang out with people from church would), I use it for my “side work” of web development and running websites like Wordtrip, and probably a few other things as well. What’s worse than GA’s CRCT? Apparently Colorado based educational think tank’s logic is. In most math problems, zero would never be confused with 50, but a handful of schools nationwide have set off an emotional academic debate by giving minimum scores of 50 for students who fail. Officials in schools from Las Vegas to Dallas to Port Byron, N.Y., have proposed or implemented versions of such a policy, with varying results. Their argument: Other letter grades — A, B, C and D — are broken down in increments of 10 from 60 to 100, but there is a 59-point spread between D and F, a gap that can often make it mathematically impossible for some failing students to ever catch up. WHAT?!? As John Gruber pointed out on his blog, that logic applies perfectly, if students get their grades drawn out of a hat instead of based on actual performance. Homeschooling just looks better and better doesn’t it? Last weekend Jake and I went to see Prince Caspian. It was good, probably needs the first one to know what’s going on a bit too much. Lewis is probably rolling over in his grave over Susan fighting. Susan in Caspian was (though a cute girl) like Legolas in The Two Towers… except not as girly as Legolas was. Saw it on a digital projection and it looked great. Overall very pleased with it. I just got back from seeing the midnight Indiana Jones showing with Jake and one of his friends. The boys both loved it. I enjoyed it, and it’s pretty good. I’m wondering, not for the first time, how much George Lucas really owes to Harrison Ford for his career. Even at ninety-eight Harrison can still carry a picture with just his smirk and gravitas. Not sure Indy or SW would’ve been anywhere NEAR the hits they were without him… pretty sure they wouldn’t have been. I had a little trouble buying Shia in his role, but by the end I think I’d finally suspended most of my disbelief in him. The big “problems” for me where special effect related: the groundhogs were totally unnecessary; the monkeys and vine swinging thing was spectacularly silly, the whole jungle “chase” (including the sword fight) seemed a little contrived from on of the Brosnan Bond movies intros; the ants thing was expectedly nasty, but also somewhat… goofy for lack of a better word. Not that Indy has avoided silly in the past, just that some of this seemed over the top-er. There was a nice nod to Star Wars (”I’ve got a bad feeling about this”), and the intro was sort of an American Graffiti throwback. The political climate (Red scare in the 50s) was done fairly well (and a bit of the expected “dig” at current politics). The whole “aliens” thing seemed less interesting plot device than the previous three with their cultural/religious grounding (though this was wrapped in that guise it felt more like a made up mythology). When it was all done I couldn’t help thinking of Steven King’s Dark Tower series and how he tried to tie in all of his works together and it was almost like they were trying to tie the Lucas and Spielberg catalogs all together. So, both Caspian and Indy were good, probably not great cinema, but enjoyable movies. C) read the article and learn from Brad. The Quarterly: What sorts of things did you do differently? Brad Bird: I had to shake the purist out of them—essentially frighten them into realizing I was ready to use quick and dirty “cheats” to get something on screen… I’d say, “Look, I don’t have to do the water through a computer simulation program… I’m perfectly content to film a splash in a swimming pool and just composite the water in.” I never did film the pool splash [but] talking this way helped everyone understand that we didn’t have to make something that would work from every angle. Not all shots are created equal. Certain shots need to be perfect, others need to be very good, and there are some that only need to be good enough to not break the spell. D) I love this one, because how many times have we gotten bogged down in trying to do something perfectly when we really just needed to look at it a bit differently and figure out how to get to 80% in 20% of the time? edit: just tweaked formatting and the last sentence because I apparently forgot the english language while writing it. I know this was a boing boing item, but the wiki-how article is the relevant one. I just need to figure out how to get Jake to do this for Gracie and we’ll be set. Collect materials for your home. They must be dry or the glue won’t stick to them. For lap siding, you can use cat tail leaves. 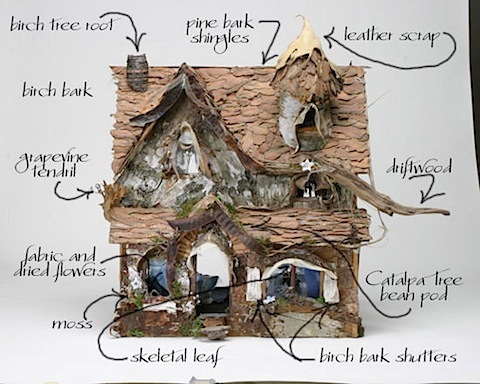 You can also make a stone cottage, or cover it with birch bark. Norway Pines have wonderful bark for shingles on the roof. Use old slips, fabric and lace for curtains. Layer them for a good effect. To detail the house, you might find some great shapes in potpourri, or from dried flowers from the garden. You can even make an entire faerie house with food!